Awl - A trapper’s iron awl was indispensable for sewing garments, cleaning his rifle, or trading with the American Indian tribes who used awls for much their daily sewing or lacing. Awls were mostly used to punch holes in leather so that it could be sewn together. 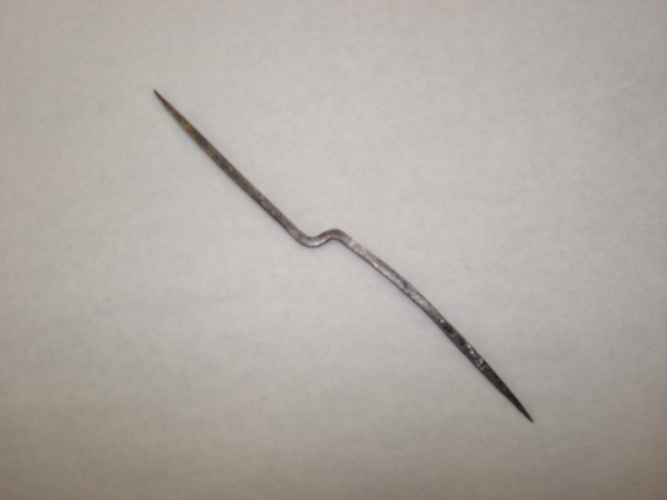 Awls were shipped by the manufacturer to St. Louis and were distributed by traders without handles. A shaped and smoothed piece of deer antler was usually affixed by the owner for easier handling. 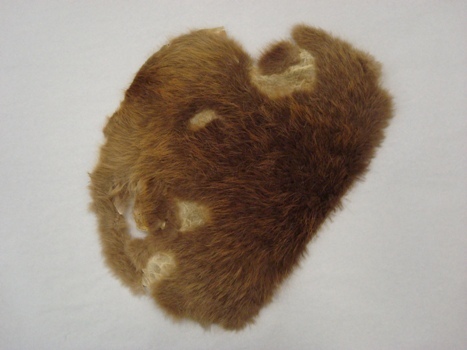 Beaver Pelt (Beaver Plew) - This beaver pelt is only a partial beaver skin. You might notice that there are two lengths of fur on the pelt. The longer more course hair was removed by the hat-maker or hatter to reveal the shorter-softer fur. The hat-maker used mercury in the procedure to remove the longer hair and during the process the mercury was absorbed into the hatter’s hands. Enough exposure to mercury very often made hat-makers go “mad” hence we get the term “mad as a hatter” and the character of the Mad Hatter in Alice in Wonderland. 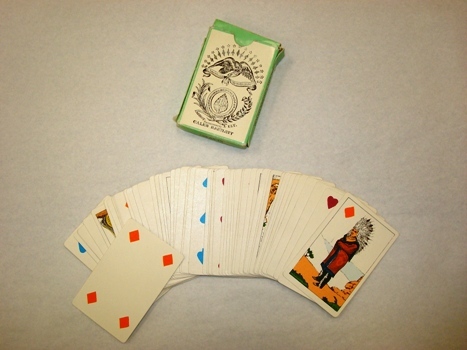 Cards - This reproduction 1830’s deck of cards looks much like the playing cards that would have been used by the mountain men. Since they were small and easy to carry, cards were carried by many of the trappers to help pass the time of day and to enjoy with their companions. 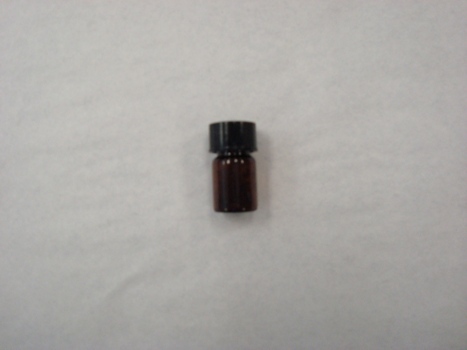 Castoreum - Castoreum, a substance from a gland near the base of the beaver’s tail, was used by the trapper as bait. It was smeared on a willow switch that he placed by the trap, and although the scent in open air was not discernible to humans, it was recognizable by the beaver at a distance. 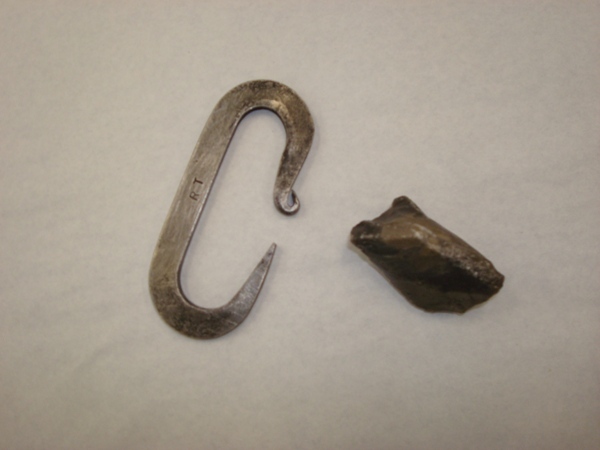 Flint and Steel - Also known as “fire steels”, these objects were of prime importance in the American Indian trade. Although they were very inexpensive, they represented an important technological innovation over traditional fire-making techniques. Trappers working in the wilderness also found this tool to be extremely valuable. A slicing blow with the shaped steel against a small piece of flint caused sparks to fly and gave life to fire. 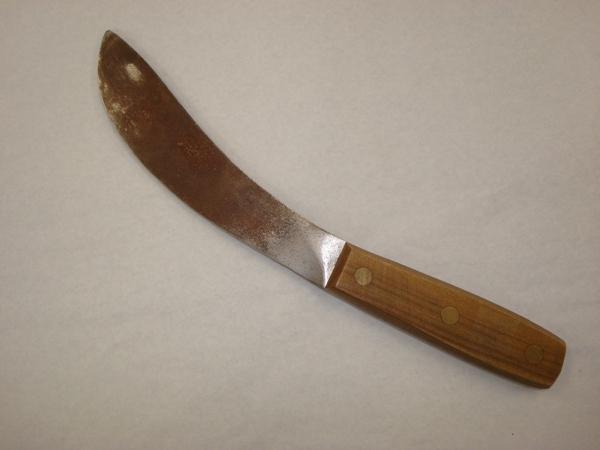 Green River Knife - One of the trapper’s most essential tools, the knife helped him kill and skin animals for food and for their pelts. The logo of J. Russell and Co./Green River Works of Massachusetts, stamped on the blade of many a mountain man’s knife, became an icon of the western fur trade. There was something very personal about a trapper’s favorite knife, and he often named it or endowed it with a personality. An attachment like this makes sense when one considers the importance of such a tool in the wilderness. 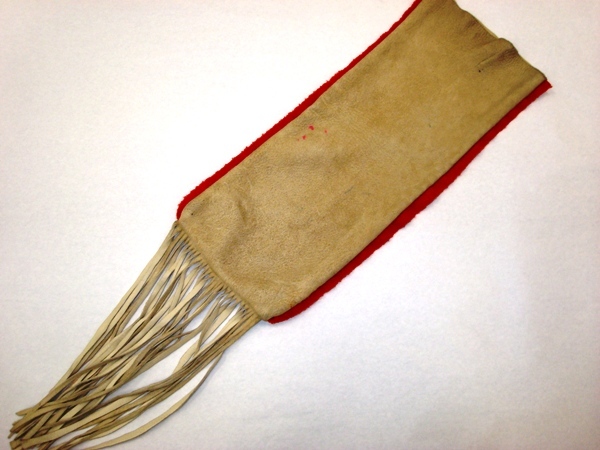 Leather pouch with quill work design - Porcupine quill embroidery was highly developed among many of the Plains Indian tribes that the trappers and traders encountered as they moved westward across the continent. This art form was a reflection of how the American Indians used their surrounding environment for ceremonial, spiritual, and everyday purposes. 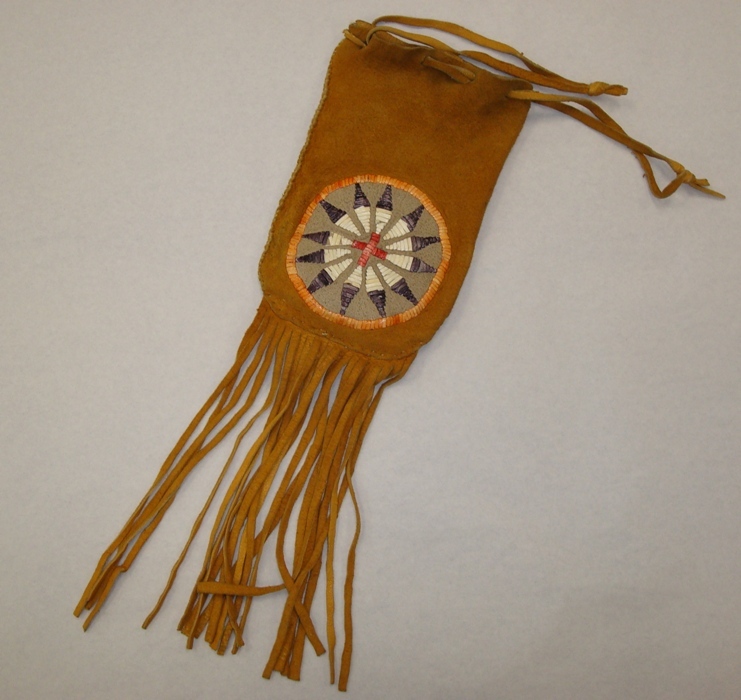 They often decorated clothing, pipe bags, tipis, and horse gear with various designs and symbols made of flattened and dyed quills. 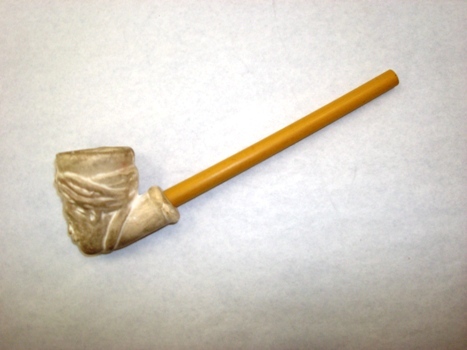 Pipe - Not every trapper owned a pipe, but clay pipes such as this one were cheap and popular at the time. Traders transported hundreds of the fragile pipes to rendezvous in barrels packed with sawdust. 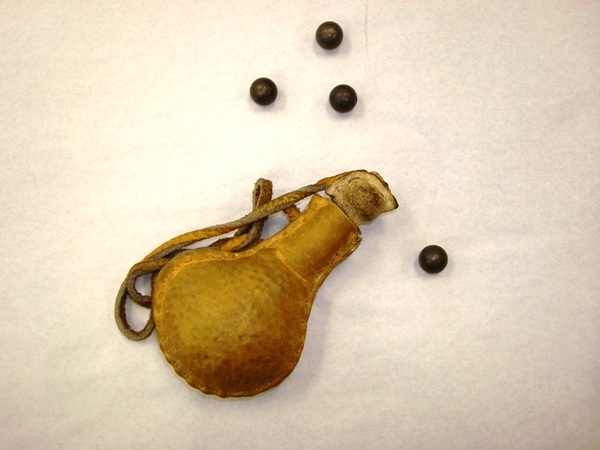 Tobacco represented a small luxury in otherwise harsh conditions and was also a popular trade item with American Indians. Possibles Bag - A very important piece of the trapper’s gear, the possibles bag was used for the storage of any number of items, from flints and steels, to the castoreum box, awls, and other tools used in daily trapping life. 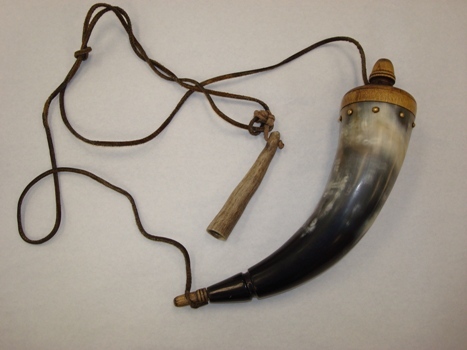 Powder horn and Powder Measure - Slung by a strap across his shoulder, the mountain man’s powder horn was another essential piece of his gear. It was often made from a steer horn, but even more frequently of a smaller, black, bison horn. The powder horn was a handy way to keep gunpowder dry, and the powder measure made sure that just the right amount was used. 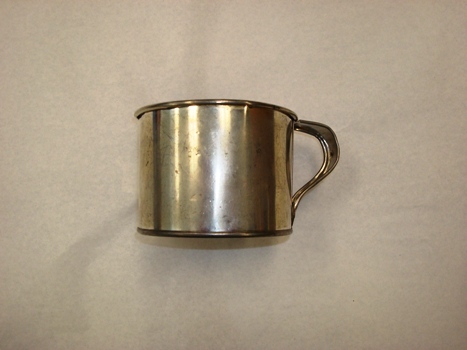 Tin Cup - While it wasn’t critical that a trapper have a tin cup, it certainly came in handy for drinking coffee or tea or when another container was needed. 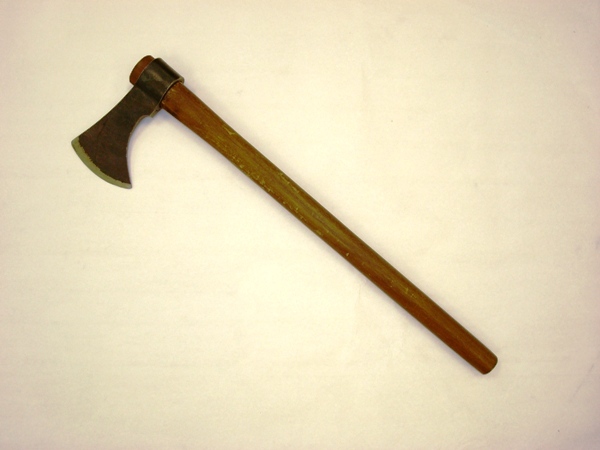 Tomahawk - Hand-forged, iron ax heads were of great importance to Americans conquering the wilderness. Essential for felling trees to use as firewood and shelter, as well as a valuable weapon, this was a heavily traded item. A blacksmith would make a trade ax by taking a single, elongated flat plate of iron and hammering out one end while hot. He would then wrap the piece of iron around a pattern to form the eye of the ax for the wooden handle. The blade was then ground to sharpness. Trade beads - Venetian glass trade beads came in a myriad of colors, styles, and sizes, and for centuries had been used by Europeans for many purposes, from ornamentation to money. 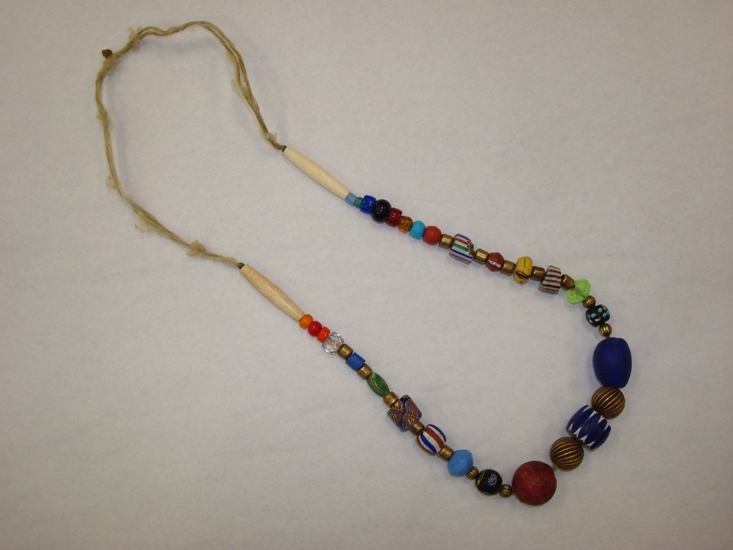 When glass trade beads reached the American continent, their polish and luster made them favorites among the Native Americans, preferred above beads of shells, bone, stone, and clay. They learned to replace quillwork with beads, while continuing to hold on to the geometric designs and forms that expressed their cultural backgrounds. Chevron beads, bugle beads, seed beads, and pigeon beads were but a few of the most popular, and they fell in and out of fashion over time. 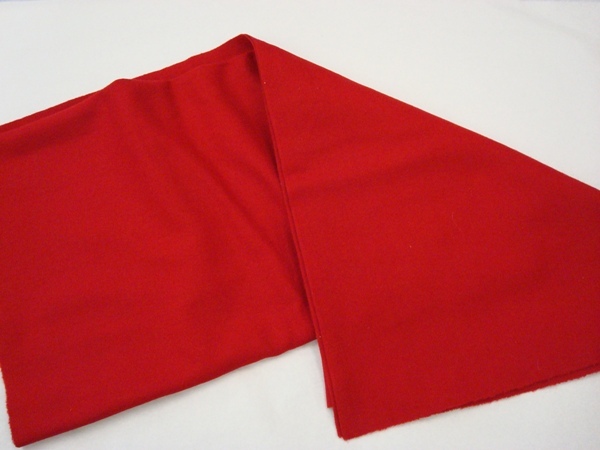 Trade cloth - The Rocky Mountain fur trade era coincided with America’s first industrial revolution—which centered on the expansion of steam operated textile mills. Trappers working in an unpredictable and harsh wilderness mostly used inexpensive wool cloth to fashion work shirts and other clothing. American Indian tribes valued cloth for clothing and blankets. Trade Silver - European trade silver pieces entered North America over one hundred years before the Rocky Mountain fur trade began. First bought by early traders and missionaries, silver work soon attracted the eyes of many Native Americans. Perhaps exchanged between the two cultures as a sign of friendship, American Indians soon demanded silver pieces as part of the trading process. Silversmiths in Europe and the United States quickly hammered out bar silver to create pieces to supply native demands. As time went on, Native Americans began requesting specific silver ornaments that signified culturally-specific ideas. Brooches or crosses might symbolize bravery, or a display of wealth, or perhaps, authority, but they did not necessarily mean to the American Indians what they meant to Euro-Americans. A Jesuit style cross of Lorraine, for instance, did not necessarily have Christian religious significance to Native Americans. 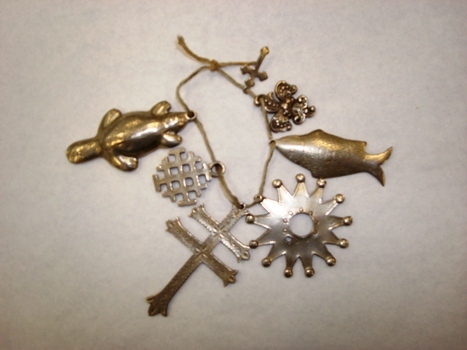 Many of the silver pieces in animal shapes, such as beavers, turtles, fishes, and foxes, became symbols used by American Indians to reflect their respect for the animals they hunted.